The Raspberries at B.B. King Blues Club, Teenage Fan Club at Bowery Ballroom, both shows Saturday July 23. The Raspberries: Through the roof. The Raspberries broke up thirty years ago, before many fans ever saw them play. Apart from a pair of New Year’s comeback shows six months ago in their nearly native Cleveland, these were the first concerts with the original line-up since 1973. A friend of mine came up from Atlanta for the occasion. I’m sure he was not the only one to consider it worthy of the plane journey. Teenage Fanclub: High. 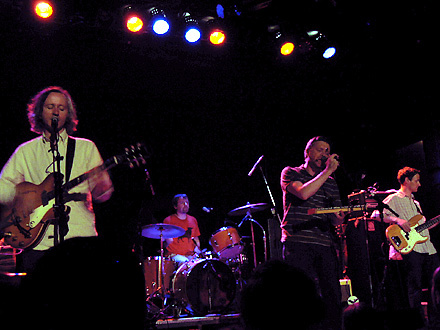 The Glaswegian four-piece, also back with their original line-up, had not played New York City for four years. For their own fanatical following, this must have seemed an eternity and resulted in two sold-out shows of their own. But compared to The Raspberries, TFC’s absence was but merely a holiday. The Raspberries: Moderate. 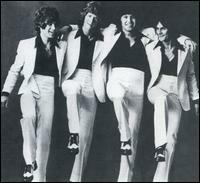 The quartet’s second single, ‘Go All The Way,’ did just that, breaking the top five on its way to a million sales back in 1972. ‘Overnight Sensation (Hit Record)’ broke the Top 20 in 1974 and is still sometimes heard on the radio. But none of The Raspberries’ albums sold in similar numbers and they never had a UK hit – hence my own lack of familiarity with their back catalogue. A friend who attended the same two shows as I did on Saturday night described The Raspberries to a Teenage Fanclub fan as “the American Badfinger.” Like that means anything to a twenty-something Brit. Teenage Fanclub: Mild. Their early 90s Creation singles, some of which inevitably evoked the shoegazing label, occasionally poked into the UK Top 75, and with endorsement from Kurt Cobain, they were considered an influence on grunge. But after a mid-nineties USA heyday on Geffen (Bandwagonesque, Grand Prix), TFC have been relegated to the minor leagues: their new album Man-Made is on Merge. They are often described in awed tones as “the British Big Star.” Like that means anything to a young Yank. The Raspberries: Astonishing. Eric Carmen explained from the stage how the group formed in 1970, just as the pop music of AM radio in America gave way to the progressive rock of FM radio, with Raspberries heroes like The Beatles, Who and Byrds being replaced by Captain Beefheart, Traffic and Jethro Tull. In “going against the grain,” as Carmen put it, The Raspberries may just have laid claim to being “the first alternative band.” My friend and Indie Pop Radio founder Rob Sacher put it one better: at a time when rock songs were getting ever longer and more bombastic he was, he insists, the only 16-year old in his high school who liked the straight-up power-pop of The Raspberries. He never knew there were 16-year olds like him all over the country. And could never have dreamed that one day in 2005 they would all descend upon a club in Times Square. As they were: The Raspberries in early-70s heyday. Now we know where The Rubettes got it from! Teenage Fanclub: Pretty damn high. After fifteen years, most groups have usually either made it big or called it a day. TFC seem reluctant to follow either rule and their fans clearly love them for it. There are many who proclaim Teenage Fan Club the best band in the world. The Raspberries: High. Carmen copped to it when explaining the group’s roots. Given that he was introducing ‘Overnight Sensation,’ one of the few hit singles about hit singles besides The Byrds’ ‘So You Wanna Be A Rock’n’Roll Star,’ he could hardly deny the comparison anyway. The Raspberries: Very high. Eric Carmen, the only band member to have enjoyed substantial solo success, carries about him a contagiously calm confidence. Guitarist Wally Bryson still wears his beret as if it was yesteryear and has the grizzled look of a Vietnam vet. Dave Smalley actually dedicated a song to America’s veterans: with his curly mullet and denim waistcoat, he plays (to) the group’s conservative bass. Drummer Jim Bonfanti wears the Union Jack on his shirt as a reminder that The Raspberries were archetypal Anglophiles. As they are: The Raspberries at B.B. King Blues Club, July 23 2005. Dave Smalley, Jim Bonfanti, Eric Carmen, Wally Bryson. Check those Beatle amps. Teenage Fanclub: Very low. Bassist Gerard Love and lead guitarist Raymond McGinley did not, I believe, say a word to the audience all night. Guitarist Norman Blake only opened up during the second half of a lengthy late show. 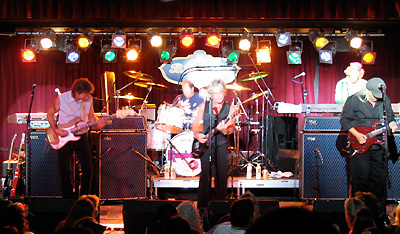 The group’s famed lack of presence partly explains their lack of present fame. The Raspberries: Good. Carmen sings like a late sixties Steve Marriott, carries rhythm guitar naturally and is a classically trained pianist. Bryson was initially understated at B.B. King’s with his undeniable lead guitar chops, but got steadily more (over)confident and (over)expressive as the show wore on. Bonfanti is often likened to Keith Moon but only a couple of times did he plow through Who-like fills – and each time (‘Overnight Sensation’ and ‘Ecstasy’) he was lauded for it. Smalley holds the fort without flash. Teenage Fanclub: Good. They may lack presence, but you have to admire the three front members their musicianship. McGinley, in particular, ranges from MBV-like fuzz to the most jangly of riffs. Only original drummer Francis McDonald, back in the fold after 15 years, failed to bring the noise; the difference in velocity between him and the Raspberries’ Bonfanti was notable. As they were and as they are: Teenage Fanclub in typically understated stage posititioning: Raymond McGinley, Francis MacDonald, Norman Blake, Gerard Love. The Raspberries: Low. There’s a reason it took this group thirty years to reform: their songs have not aged well. The sugary melodies and tight harmonies of ‘Take Me Away,’ ‘Tonight’ and ‘Let’s Pretend’ still sound like the decade from which they emerged. And though the eight-minute ‘I Can Remember’ could have been a blueprint for Jim Steinman, the encore ‘I’m A Rocker’ sounded like it belonged to The Faces in all their mid-seventies slobbery. Teenage Fanclub: High. What they lack in stardom they make up for in the songs. ‘Hang On,’ ‘What You Do To Me,’ and closing song ‘Everything Flows’ all had the feel of permanence. As they should: they’re a decade old or more already. Even ‘I Need Direction,’ from the widely ignored 2000 album Howdy, has stood the test of time. The Raspberries: Zero. Let’s be honest, you don’t go see a group come back after 35 years to hear their middle-aged attempts to write new youthful hit singles. The Raspberries stuck to what they knew – and what the crowd knew too. Teenage Fanclub: High. There were more songs from the new Man-Made album than I could count, of which only ‘Nowhere’ was properly introduced and noted. But give Teenage Fanclub extra points for keeping it interesting: of the first six songs in Saturday night’s set, apparently only one had been performed the previous night. Teenage Fanclub: Drunkenly enthusiastic. When your favorite band only comes to the States every four years, you’d best stick around to the bitter end. And those who stayed on their feet ’till the 1.30am finale were rewarded with a show that steadily improved as it progressed. Many of them were also drunk, as perhaps befits the following for a Glaswegian group. But stereotypes exist to be damned. Norman Blake was halfway through the show before he pronounced that it was “time for a beer: it’s Saturday night after all.” It was, by then, Sunday morning. But after four years, who was counting? Is Eric Carmen the Clevland Alex Chilton?